"We're using Y-wings because of their greater firepower. But they move like a sleepy Hutt, so watch it." The BTL Y-wing starfighter was a fighter-bomber built by Koensayr Manufacturing. First used during the Clone Wars, then throughout the Galactic Civil War, it was a mainstay of the Alliance Starfighter Corps. It was often used as an assault bomber to attack enemy capital ships directly in conjunction with the later B-wing starfighters. "They're the workhorses of this outfit, I can tell you that." Affectionately known as a "wishbone" to Rebel Alliance and New Republic pilots, the Y-wing starfighter was deployed as a fighter-bomber, designed to fight its way to its objective, deliver its payload of high explosives, and fight its way out again. Its weaponry included two laser cannons, two ion cannons, and two proton torpedo launchers. An astromech droid, such as an R2 unit, could be plugged into a socket behind the cockpit to act as a co-pilot and manage the ship's various systems. The Y-wing was a resilient, well-shielded craft, but was slow and ungainly compared to other Alliance fighters. Its deficiencies were partly compensated for by the heavy proton torpedo load it could carry, and its ability to paralyze craft with ion cannon fire without destroying them, a unique ability until the B-wing starfighter was introduced after the Battle of Yavin. In addition to the Rebel Alliance, many planetary defense forces, mercenaries, and pirates fielded the craft. The design had many flaws and required constant maintenance. The Y-wing was originally entirely sheathed in an aerodynamic, elegant fuselage, but its high-maintenance nature led to many aggravated maintenance crews getting fed up with constantly having to remove the superficial hull plating and disposing of it altogether. Due to this, many Y-wings had no hull plating (except on the cockpit), exposing the internals of the main hull. Pilots found that this lightened the frame and kept components cooler, noticeably boosting performance. In at least one Y-wing, special features were included which assisted in the event of crashing on the surface of a planet. Inflatable balloons were deployed which kept the ship afloat in case of a water landing, and the cockpit could be ejected from the rest of the ship and driven as its own vehicle. It is unknown whether this was a standard feature or a customization. "They've always gotten me home in one piece." 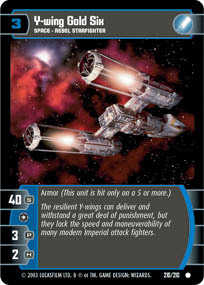 Despite its shortcomings in speed and maneuverability compared to space superiority fighters such as the X-wing (or especially compared to interceptors like the A-wing), the Y-wing was an extremely durable craft, with heavier armor and shielding making it a favorite among some Alliance pilots during the Galactic Civil War. The Y-wing also had a larger torpedo magazine. The Y-wing was not a sluggish fighter overall, as its speed and agility exceeded that of its intended replacement, the B-wing, but its lack of mobility meant that the Y-wing was not effective as a space superiority fighter. When properly used by such commanders as General Grisserno and Horton Salm, Y-wings would accelerate towards their capital ship targets, relying on their gunners and wingmates in X-wing starfighters and A-wing interceptors to distract enemy fighters and the enemy ships' gunners. This would allow the Y-wings and B-wings to focus their fire on capital ships. This tactic was similar to the A-wing Slash, which involved solely X-wings and A-wings. There were three common designs of Y-wing, one used during the Clone Wars and two during the height of the Galactic Civil War, as well as five less common variants. The first known model was the BTL-B, which served the Grand Army of the Republic during the Clone Wars. Unlike its successor designs, the BTL-B model had a full hull covering on both the primary fuselage and engines. A bubble-turret, which swivelled 360 degrees, provided a clear view for the gunner of the surrounding space. The ship was designed to operate mainly as a bomber and the Republic used them well in this capacity. On later models, this bubble feature was replaced with a turret operated from within the main cockpit. The BTL-S3 was a two-man strike fighter, and was the most common Y-wing configuration. The weapons systems officer typically operated the ion cannon turret when needed. Luke Skywalker used this variant on his mission to Panna in 0 ABY, as did Leia Organa and C-3PO on their journey to the Circarpous system. Many Y-wings of this variant were modified to become the S3B variant, with defensive rapid-fire blaster turrets replacing the ion cannon turret, and particle cannons installed in place of the dual laser cannons on the nose. These Y-wings were used as heavy capital ship destroyers, and were eventually phased out by the new B-wing starfighters. The BTL-A4 was a one-man version of the S3, which removed the gunner position and locked the overhead ion cannon in a forward-facing position. Shield strength was also reduced to boost engine speed. It was commonly used by pirate, mercenary, and private defense forces, and therefore was also used by the early Rebel Alliance as the primary starfighter for bombing and disabling roles. However, the lack of a gunner and reduced shields typically proved a liability and made the A4 unpopular among pilots. Notably, only one A4 fighter from the Alliance's Gold Squadron survived the attack on the Death Star at the Battle of Yavin. 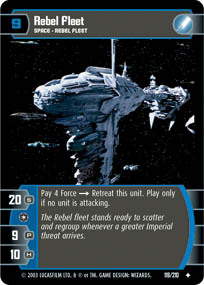 As the BTL-S3 became the primary Y-wing variant of the Rebel forces, the A4 was still kept in many units as a supplementary craft. However, Red and Gold Squadrons favored the A4 variant of the Y-wing and used it with distinction in several climactic battles, such as the Battle of Yavin, the capture of the Death Star II plans from the Imperial freighter Suprosa, and the subsequent Battle of Endor. Main article: BTL-A4 LP "Longprobe"
An additional (though less common) BTL-A4 variant known as the "LongProbe," designated BTL-A4 (LP), was equipped with a nav computer, backup hyperdrive, advanced scanners, and an extended fuel supply in place of the weapons systems officer. While this was not enough to make it into a true scout craft, its heavy armament gave it a better chance of survival and allowed it to occasionally cause damage to the targets it was scouting. The LongProbe was used primarily for long-range scouting missions. On such missions, LongProbes operated in recon teams known as LongProbe Y-wing Recon Teams. One such team was sent to Alashan to check a Rebel archeological dig that failed to report back. In contrast with most other Y-wings, this variant was considered too valuable to remove from active duty by the New Republic. Alliance Intelligence utilized specially modified Y-wings for long-range courier duty. This variant of the BTL-S3 had no ion cannons (which were removed for baggage space), a larger main cockpit area able to carry up to five people, and a special canopy split down the middle for rapid embarking or disembarking of a passenger during brief landings. This canopy also allowed a passenger to bail out at high altitude and paraglide to their destination. The customization was rare enough that no special designation was created for these modified Y-wings. Some of the last Rebel soldiers to evacuate Hoth used Y-wings of this type. The variant was used by Princess Leia and Luke Skywalker on missions to Velmor and Ventooine. A Y-wing modified similarly by Rendili StarDrive was used by Skywalker while he was working for the Senate Planetary Intelligence Network and helping the Jedi Prince Ken. The Light Y-wing was a light bomber, which lacked the support pylons on the engine. The Heavy Y-wing was a bomber with heavier ordnance and four engine pods. Koensayr Manufacturing designed the Y-wing for use by the Galactic Republic in the Clone Wars, and although the BTL-B model saw combat, as flown by Anakin Skywalker and a group of clone troopers to disable the Malevolence, the more commonly known BTL-S3 came later. The Y-wing also served during the Battle of Ryloth, in the Battle of Kamino to stop Separatist frigates, and at the Battle of Malastare to help secure the electro-proton bomb by Vulture Droids. When the Galactic Empire declined to buy the design, Koensayr began selling to various parties, and Y-wings found their way into pirate and mercenary forces; thus the fighter ended up with Rebel groups early in the Galactic Civil War. BTL-S3 Y-wings were in service at least as early as 18 BBY, and it was a critical vessel in the Rebellion's early days, bearing the brunt of all of its early space battles with the Empire. The Rebels lost more Y-wings in the Galactic Civil War than any other fighter, due to the simple fact that they flew more Y-wings than any other fighter. Even after the introduction of the X-wing, which largely succeeded it in most roles, it continued to serve as an important part of the Alliance arsenal. The Y-wing was best suited for heavy assault missions due to its larger warhead payload and stronger hull and shields, while the X-wing and A-wing were more focused on dealing with enemy starfighters. It was also invaluable for disabling craft since it was for a time the only predominant Alliance starfighter with ion cannons. The more heavily armed and more advanced B-wing was supposed to supplant the Y-wing for such assault and capture missions. However, the Y-wing still retained an edge over the B-wing in armor. As the Y-wing was a proven design and easier to pilot than the B-wing, which was available in limited numbers, the Y-wing continued to play a role as late as the Battle of Endor. By the time of Grand Admiral Thrawn's campaign against the New Republic, Y-wings were relegated to planetary defense duties, leaving attack missions to X-wings, A-wings, and B-wings. Their age made them more difficult to repair, and many expected them to leave service as newer fighters came into production. One exception to this general demotion of Y-wings from active duty was the BTL-A4 "Longprobe" scout, which filled a vital niche in the reconnaissance role. Although partially replaced by the T-65BR X-wing variant, these fighters were considered too valuable to withdraw. Instead, they were upgraded, extending their usefulness until the final years of the long conflict with the Empire, if not beyond. Additionally, stubborn old Y-wings, in varying states of repair, were still found throughout the galaxy long after the Galactic Civil War. During the Yuuzhan Vong War, the Fia of the Galantos Guard employed Y-wings in defense of their homeworld, though pilots of the Galactic Alliance referred to the starfighters as "old" and "clumsy." Other Y-wings found their way into private ownership and continued to fly during the Second Galactic Civil War. In 44 ABY, an antique Y-wing was docked at Skifter space station orbiting Kuratooine. Famous Y-wing pilots included Jon Vander, who led Gold Squadron during the Battle of Yavin; Keyan Farlander, the only surviving member from Gold Squadron in the attack; Davish Krail, who had flown them for five years; and Horton Salm, one of the New Republic's foremost Y-wing pilots. Salm led the Alliance's Gray Squadron at the Battle of Endor, surviving the run through the second Death Star's superstructure, later leading Aggressor Wing through the Battle of Brentaal IV, which saw him promoted to the rank of general; he continued to command the Aggressors during the evacuation of Ciutric. Star Wars: Incredible Cross-Sections erroneously refers to the BTL-A4 Y-wing starfighter as the "BLT-A4 Y-wing." This error was fixed in the latest book, Star Wars: Complete Cross-Sections. Because of the conflict in continuity between the Y-wing's appearance in the Clone Wars series and its history prior to this series, Jason Fry attempted to combine the different sources in the Y-wing's sensor profile in The Essential Guide to Warfare. Star Wars: The Clone Wars – "Nomad Droids"
Empire 13: What Sin Loyalty? Star Wars 5: Lo, The Moons of Yavin! The Word for World is Death! Star Wars Annual 2: Shadeshine! Star Wars 78: Hoth Stuff! Wookieepedia has 252 images related to BTL Y-wing starfighter. ↑ 32.0 32.1 Cracken's Threat Dossier, page 82. ↑ Star Wars 78: Hoth Stuff!